Don’t you think it’s about time you put your website in the hands of a responsive website design company? Your clients and potential customers are on the move and have little or no patience if they cannot view your site properly when they are searching for information. In all likelihood, they will ditch you for your competitor’s services! Responsive design will take care of factors such as click versus touch, screen size, pixel resolution, removal of obsolete Flash technology, and optimized markups. You will also maximize Search engine optimization (SEO) and deliver better results on your digital marketing strategy. 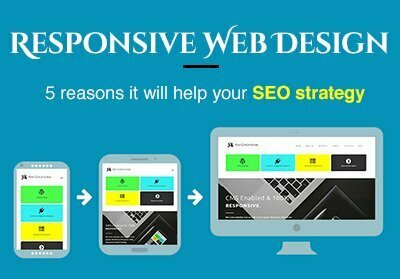 How can a responsive web design help your SEO strategy? In the jungle of Internet Search, Google is king. Google in no ambiguous terms says that the configurations they recommend should mandatorily be that of a responsive web design. Google opines that responsive websites will perform better in search rankings and likes that responsive sites use unique URLs rather than different URLs for separate mobile versions of websites. So, why not follow the leader? Isn’t it double trouble all over if you aren’t making a consolidated responsive design? You would be developing two sites for two mediums, one for the website and one for the mobile! This duplication will incur double costs. Besides, when your targets try to access the advanced options on your site via mobile, they will be redirected to another site. Mobile sites do not support all functions, which will frustrate and anger your harried target. Your SEO costs will also be higher when it has to accommodate two locations, instead of one. In a responsive web design, the golden egg is the unique URL for every page. The unique URL links to your master site and the mobile site. The absence of multiple URL’s for the same page won’t affect your page search engine optimization ranking adversely. The back-end profile for both mobile and desktop is also the same, making your website stronger and user-effective. Imagine your clients struggling with infinite horizontal scrolling as they seek to access the chat feature on your site? In a fit of impatience, they will leave your page after a few clicks. This bounce in traffic will alert Big G, which will decrease your rating, thus impacting the traffic of potential customers negatively. When you go with a responsive website design, the pages will adapt to the medium and cause no horizontal scrolling. The design will up your ranking in SEO, as pages will no longer open up in a non-targeted viewership medium. 7 seconds for a mobile page to be uploaded? Google wants it down to 1 second. This drop may seem impossible, but not with a responsive web design which has unique URLs and does not redirect any queries to an individual URL which consumes loading time. An added benefit? You will experience an improved SEO. To leverage on a responsive web design and see your SEO strategy work, contact us. We are a Professional Web design company delivering web successes since 1997. We create responsive websites, custom business automation softwares, mobile applications, commerce enabled systems and online promotion strategies.